Our product is the most powerful and cost effective solution on the market, for just . Most of them can only clean Comma Separated Value files. But who uses CSV fields for making calls? Most salespeople use some sort of database. We have features they have not even thought of. Others create a separate list of phone numbers that are on the DNC list, and those that are OK to call. But this does you no good if you need to clean the numbers in your database. 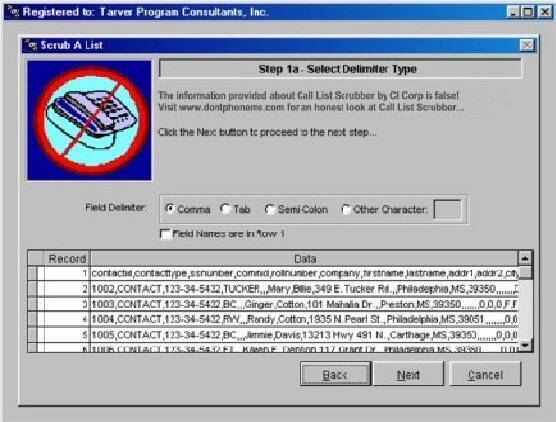 Here are some we have been able to find on the web for "Do Not Call Software". & keeps you in compliance. You have to export to a delimited file, then re-import in to the program you are using. This may unlink the records from their Notes, Calendars, and History entries. For relational databases, you need a program that directly cleans the file you are using, not a copy of it. They give no screen shots, or specifications on what data files are supported. Probably they are ashamed to show it. "The DNC Wizard can check every number in your files quickly creating 2 lists for your marketing, an OK to Call and a Do Not Call list." So this means it only creates 2 out put files, but DOES NOT clean your existing file. This is worthless. Only handles one (1) data format - Delimited files, while our CallNot software handles over 15 file formats! 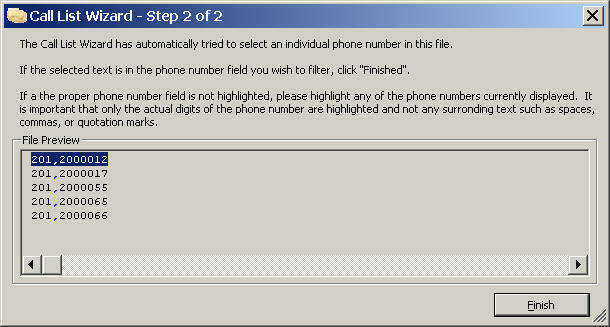 Does not mark the DNC numbers in your contact manager, but a separate, disconnected file. 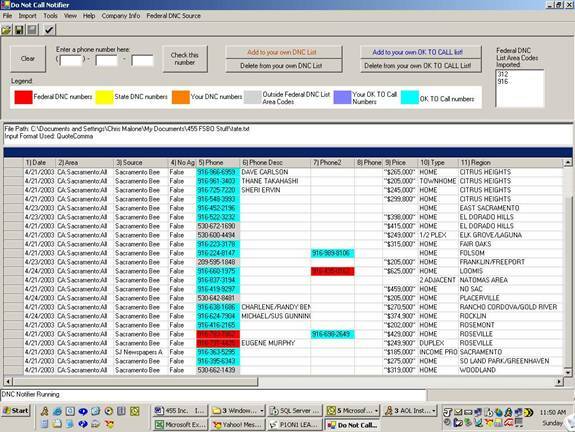 Our software marks the numbers where you need it - in the software you use for contact management. This is a pretty simple program to use. It only accommodates CSV (Comma Separated Value) files, not DBF, MAX, XML, or any ODBC database. It only creates 2 lists from your original. If you want to clean your original database, this program will not work. They don't display any particular software you can download and use, and mention call center solutions, probably very expensive. 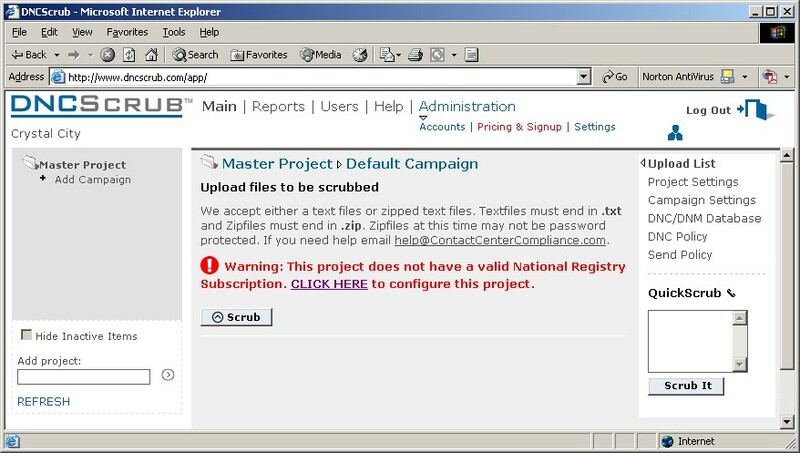 http://scrubdnc.com offers to scrub your database for you. Unfortunately, this is in violation of the FTC's rules against DNC list sharing, or distributing the cost of the list among different companies. This site may not be up long. and programs for Windows PCs. 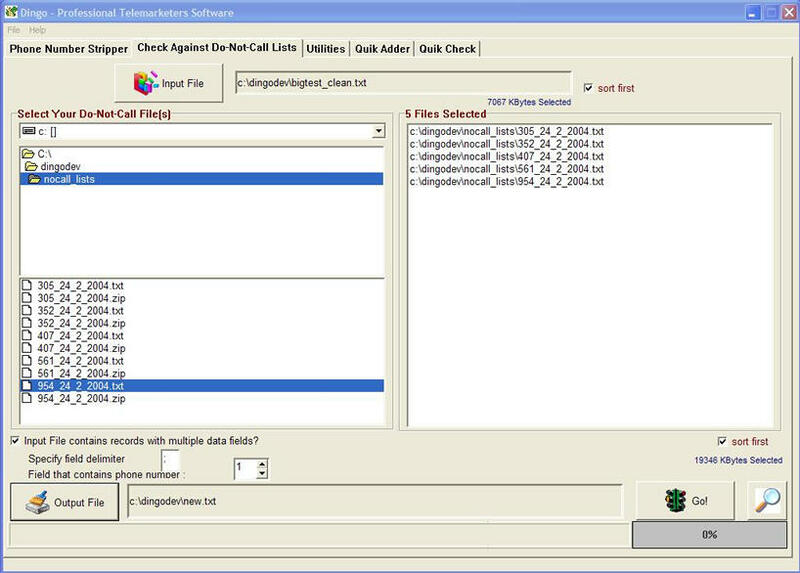 This site from Australia has information on phone software for making calls, but does not specifically mention preventing Do Not Call numbers. Does not mention a particular Do Not Call solution. Seems to offer various computer telephony solutions. This one is pretty good, and the most similar to ours. But it is Microsoft Access MDB based, and cannot hold the full 57 million record database practically. It is extremely slow (taking days) to process at that number. 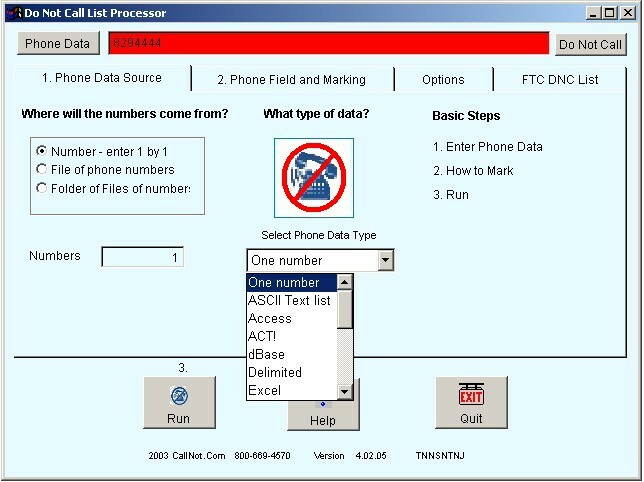 That is why we chose Microsoft FoxPro for our CallNot DoNotCallSoftware.com, which is lightning quick, even at that number of records. Handles millions of records quickly and easily. Depending on your calling patterns, your DNC list may contain millions of numbers. It is impossible to clean your list manually or using a standard program. Works with text, csv, Excel, Access files. You do not have to convert your files to any other format. Just browse to your file and click "Start". You can process the file directly. Imports the National DNC list directly. One click to import, no complicated conversion of data. Creates a separate text file of the DNC numbers removed from your calling list with date and time removed. Works with both seven digit and ten digit numbers. Other programs require the area code or they will not work. Single number search capabilities, just type in the number and click search and you can verify if the number is on the DNC list. Delete any DNC matching number, mark the number or mark another field. Never wait for someone to scrub your list again and stop your business in its tracks! Online service - You can only upload simple TEXT only files, not Access, ACT!, Excel, Goldmine, Maximizer, and all the other formats we accommodate.. Here's another one that thinks making export lists from the original is useful. We are so confident that our product is the best.